With a delayed spring haul out was postponed but April 17 it was time. The only shipyard capable of lifting Dora Mac was a shipyard 30Nm south of homeport. They do not have a travellift but took Dora Mac out of the water on a wagon. Bottom looked reasonably well and Sigma Ecofleet 530 has been the best bottompaint so far. Ten liters of new paint was imported this year from the U.K (you can`t find it in Sweden). Only the anodes on the bow thruster needed replacement. 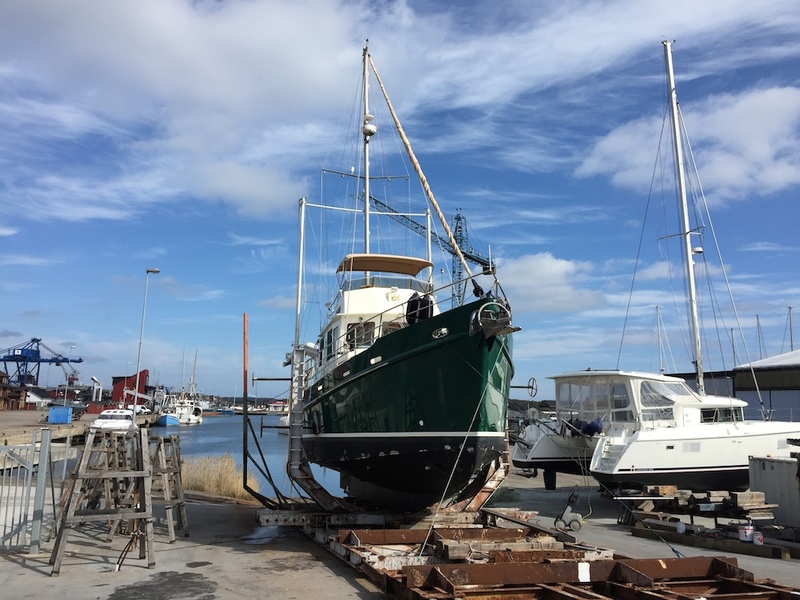 We spent three days on the hard also painting corroded areas on deck. Once back in the water no water came from the exhaust and allthough priming the impeller house from lot´s of air it didn´t work. Faultsearch revealed a broken impeller with rubber parts jammed in the outlet. Allthough a bit tricky to get the broken impeller out, this was the right place to have this problem.